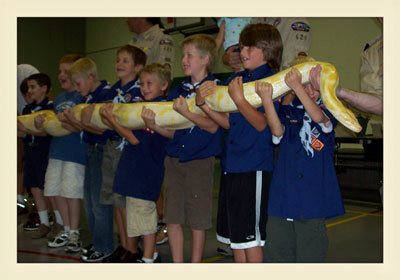 Our reptile shows are meant to educate as well as amaze all that attend. During our program will describe the characteristics and behavior of each critter as you get to touch them. As a rescue we also discuss Responsible Pet Ownership. We talk about how we came to get our rescued critters and the mistakes people make in the pet choices. We answer any question and will make recommendations on care and pet selection. We can tailor our shows to meet your needs, i.e.. snakes only, critters by region, scout badges, endangered critters, or what ever your needs are. And remember your show helps support our rescue. prices based on distance to show. Shows are $175.-$250. for the first hr. and $50. for each additional 1/2 hr.